Every print subscription includes unlimited digital access, but to take advantage of it, you must have a digital subscriber account. These tutorials will guide you through the process of creating and using your digital account. As you click on the links, make sure the new pages open up in a new tab or window so you can toggle back to the tutorial for reference. If you need more help, please call Customer Service at 206.624.7323 or 888.624.7323. What is a digital account and why do I want one? 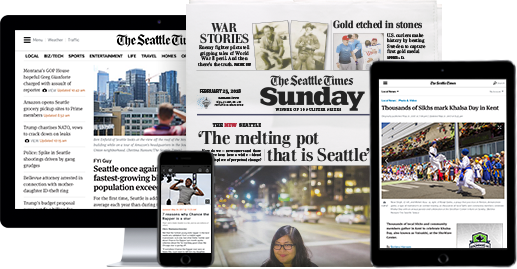 Print subscribers have access to all Seattle Times products – print and digital. 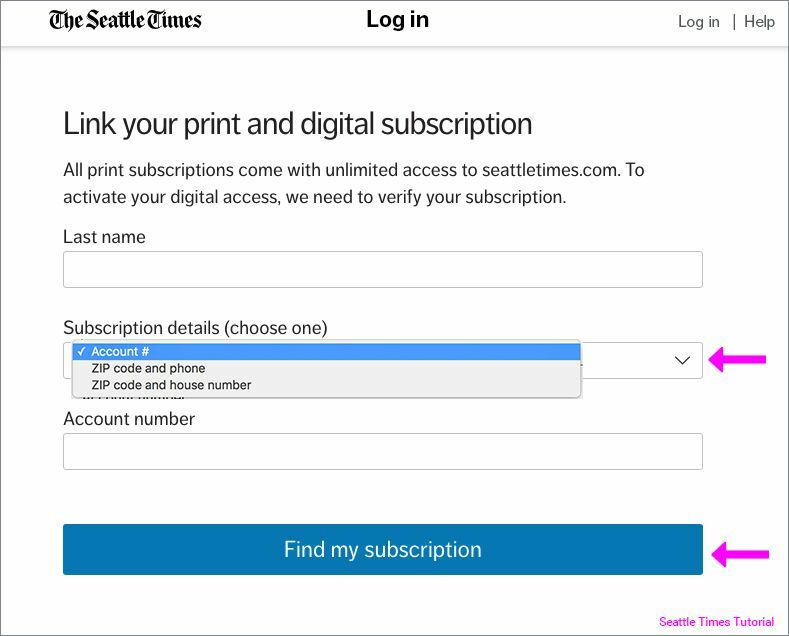 A digital account allows you to read unlimited articles on our website, seattletimes.com, and access Print Replica, an exact digital copy of the printed paper to read, download or print as a PDF. 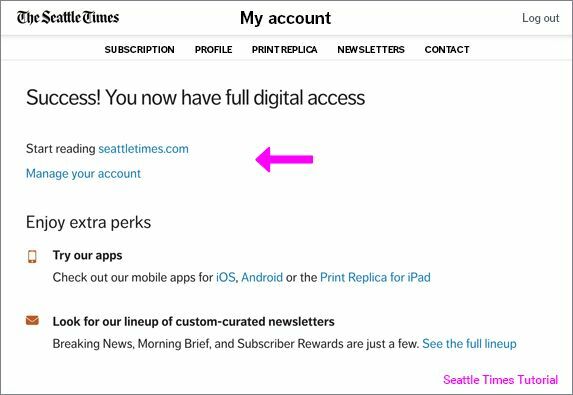 You can also use your digital account to log in to our mobile apps which include The Seattle Times for Apple and Android devices, and Print Replica for iPad and Android tablet. Unlimited access to our website and mobile apps are included with your subscription. And with a digital account you can manage your subscription online: pay your bill, schedule a delivery hold, report a missing paper and more. If you are a print subscriber who does not have a digital subscriber account, the tutorial “How to create a new digital subscriber account” will help you create one. Step 1: Go to the Log in page on the Seattle Times website. NOTE: It's easier to follow the tutorial if you open the log in page in a new tab in your web browser so that you can toggle back for the instructions. Step 2: Enter the email and password associated with your account and click the blue "Log In" button. 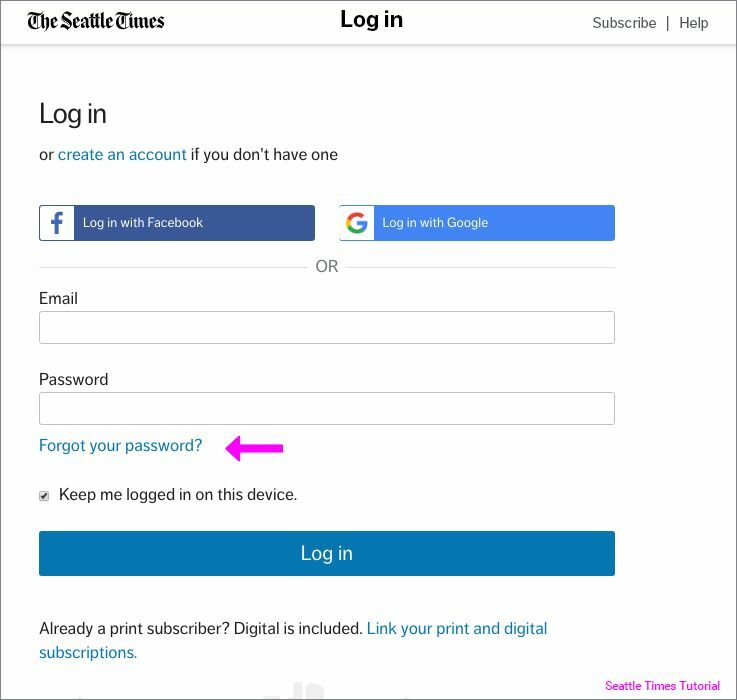 If you would like to skip this step the next time, and be automatically logged into seattletimes.com when you visit our site, check the box titled "Keep me logged in on this device." That's it. 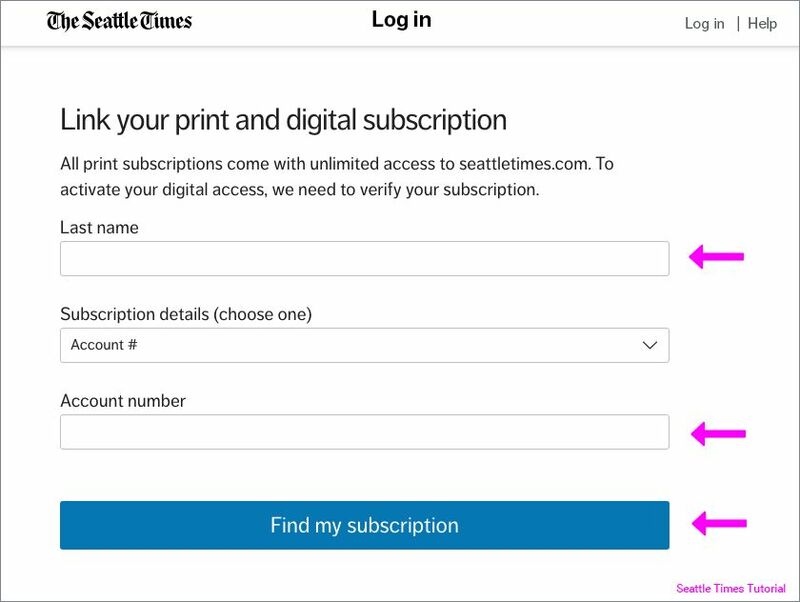 You should now be logged into and able to enjoy full digital access to seattletimes.com. To find out more about what you can do with your digital account, click here. 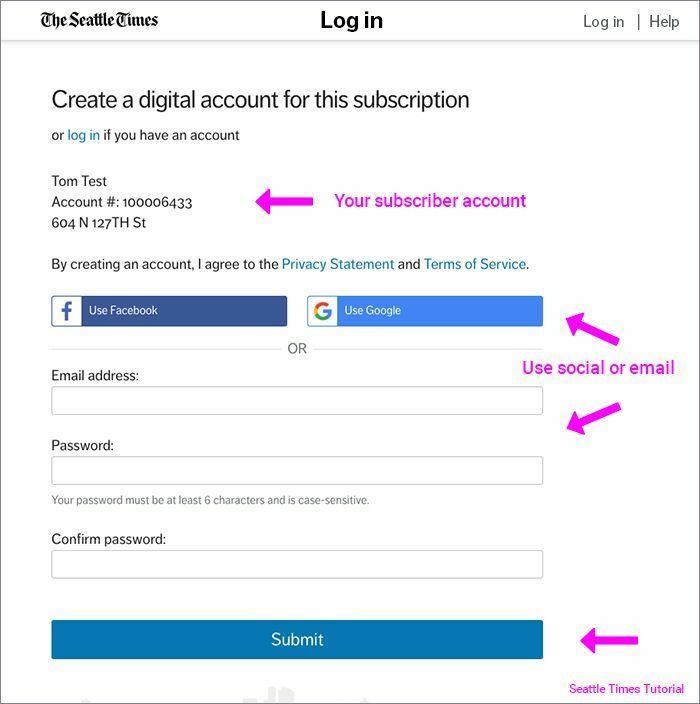 If you forgot your password or need to create one for the first time, follow these steps using the email associated with your Seattle Times account. If you need to create a digital account from scratch (e.g. you're a print subscriber who originally signed up over the phone, mail etc. ), go to the tutorial to How to create a new digital subscriber account. Step 1. Open the log in page and click "Forgot your password?" under the password field. Step 2. Enter the email address associated with your account and click on the "Send Link" button. 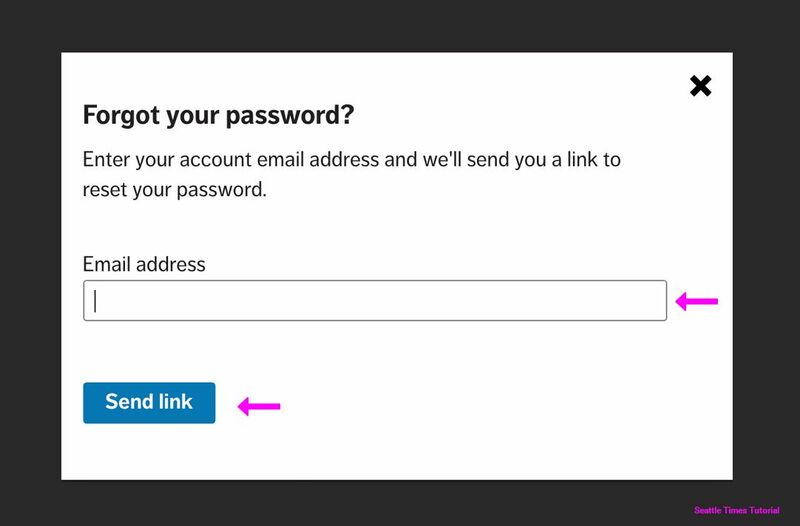 This will send you an email with a link to reset your password. Step 3. Open your email and select the message with the subject line "Reset your password," then click on the link in the message body. 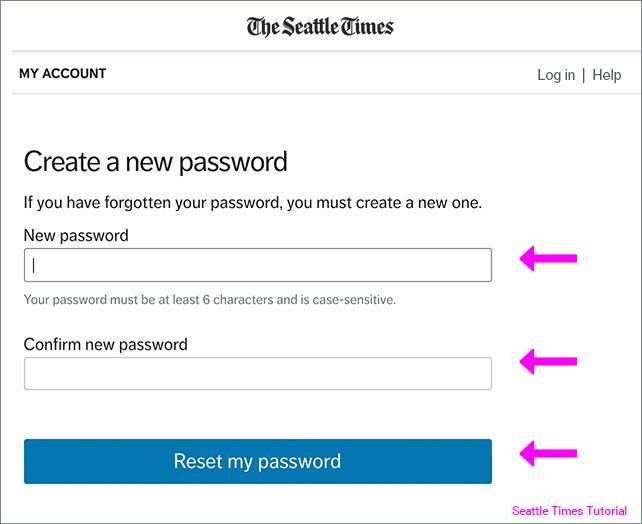 This will take you to a Seattle Times page to create a new password. Step 4. Enter your new password. Then, enter it again in the "Confirm new password" field and select the "Reset my password" button. Your password needs to be at least 6 characters and is case-sensitive. Step 5. A new page will appear to confirm the password change. Click "Continue" to exit this screen. This is now your seattletimes.com password, so be sure to keep it somewhere you'll remember it. If you are a print subscriber who has never used our online services, you will need to create a digital account that links to your print subscription. 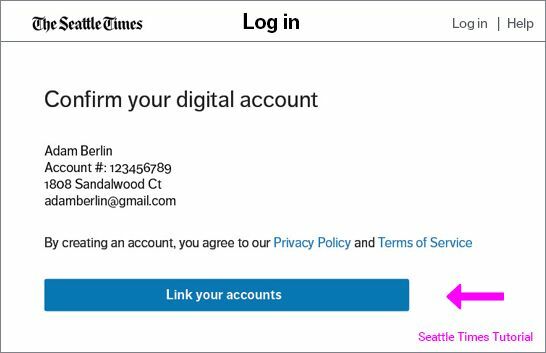 This also applies if you log in to the Seattle Times website, but are not recognized as a subscriber. This tutorial will get you set up so you can read unlimited articles on our website, manage your account online, and more. Step 1. Go to Link your print and digital subscription. This will open the page on the Seattle Times website. Step 2. Find your subscription online. You may search by last name, ZIP code and phone number, or ZIP code and house number. Step 4. Select the search criteria you would like to use and enter that information in the text fields. Step 5. Select the blue button "Find my subscription." This will open the page "Create a digital account for this subscription." Step 6. Now you're ready to create a digital account. First, confirm that your subscriber account is correct. Step 7. Fill out the form with your email address, or click on the buttons to use your social media account and follow the appropriate step below. If you use the email form, select the blue "Submit" button and you're done! If you use social media to log in, continue to Step 8 to confirm your account. 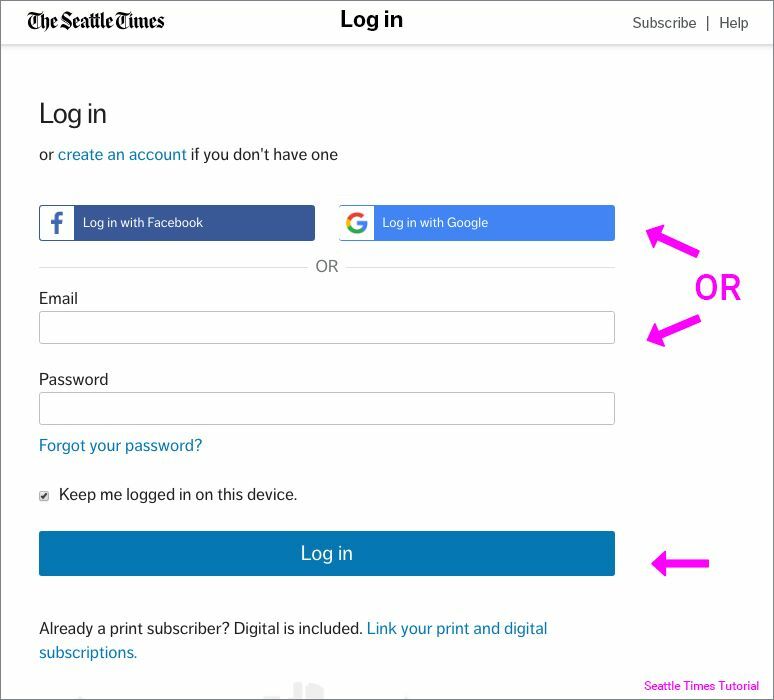 If you already have a digital account, click "Log in" below the headline to log in with your Seattle Times email and password, and finish the linking account process. Step 8. Confirm your account by clicking on the blue "Link your accounts" button. Success! You will get a page like the one below that confirms your digital account is active.